Letters of popes, bishops, abbots and theologians were preserved as important documents in the middle ages. They contained important historical and legal information as well as rich theological material. Often the work of saintly authors, they were kept as documents of holy lives. St Jerome (about 340-420) was one of the most important theologians of Christianity, who corresponded with many of the powerful people of his time. This manuscript contains his letters and belonged to the cathedral priory of Rochester where it would have been consulted as an authoritative source on history, theology and canon law as well as read as a document of a saintly, scholarly life. 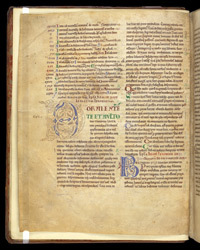 At the top of this page, a list of the letters of St Jerome contained in the volume comes to an end. Below Letter I begins with a large initial bearing with drawn vine and animal decoration. Colour is limited to the pale blue within the letter and smudgy black which may be a later addition. The style of the decoration resembles that of England and northern France in the early 12th century. Drawing had been developed to a high level in Anglo-Saxon art of the previous century, and this decoration appears to echo that tradition.